This morning while in that zone between sleep and awake...the zone where short clips of dreams seem to crowd my sleep...as if they know there is only so much time and so they show small trailers or previews about an upcoming dream...well, during all of that....I hear Ace. In my slumber I was not sure whether to finish listening to Mr. Spock speak of how logical it was to write blogs. His piercing eyes and pointy ears were softened when he gave his Spock salute and spoke those memorable words, "Live Long and Prosper". I was basking in all of his wisdom and was ready to hear more....maybe get some ideas for a blog post. But Ace interrupted this hazy vignette, and it took all my mental energy to catch it in my dream net to be able to retrieve it once I was fully awake. Sometimes those morning dreams slip too quickly away and are lost...but I managed to hold on to Mr. Spock. So...who is Ace? Ace is our woodpecker. I have heard and seen him at various times this winter...but in the spring, Ace seems to pick the morning to search for his food in the tree closest to our window. We like to name the critters that like to hang out in our yard....and there is usually a story to the names. (Read about Half Rack... Gentle Deer) Ace received his name because he often came in the morning...either awakening us, or signaling us to get moving. We called him our alarm clock...but we couldn't name him Alarm Clock...that just did not have the right ring. So, Ray shortened it to A.C. When we said A.C. quickly it sounded like 'Ace'....and that is how he got his name. 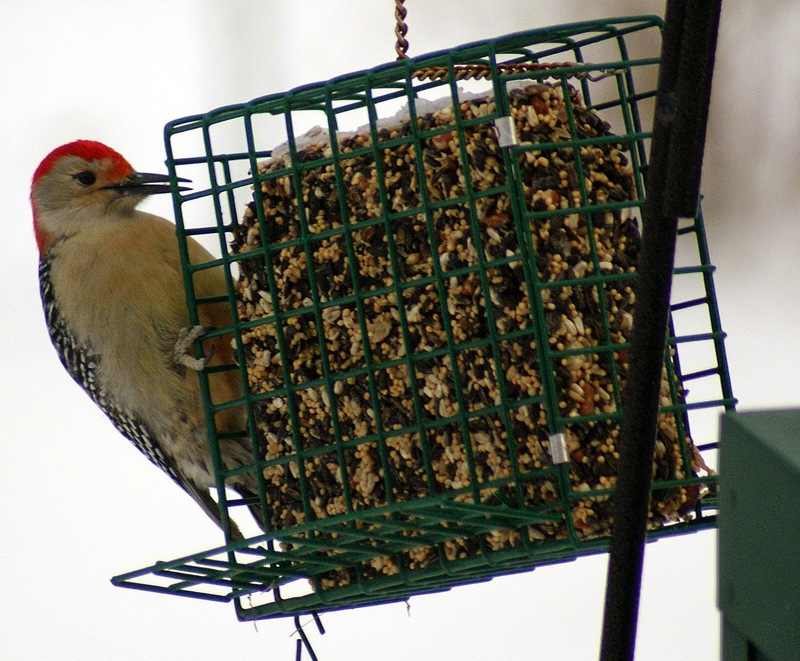 Ace, our red-bellied woodpecker likes to eat suet. I am glad Ace has returned. Maybe I can get some better pictures of him this year. You and your critters! Life would be so dull without them and your stories. Ace...love his name and it sure fits his job description. Does he know he has a job? How dull life would be without critters...those who deign to be our pets as well as those who live in the wild. So glad you were able to post. I really look forward to reading your blogs. What a fun combination of topics - a woodpecker, spock and blogs. ;) You brought a smile to my face. I bet you all are so glad to see signs of spring after your winter. And such a handsome one must bring quite a smile early in the morning.